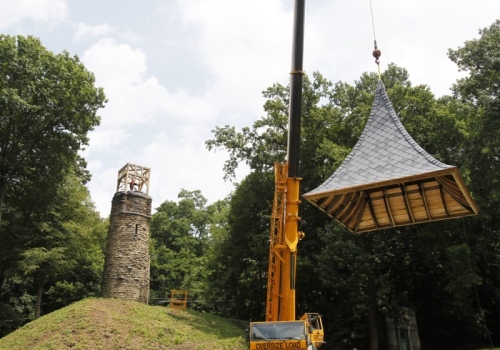 AKRON — A new roof for an old bell tower was lifted into place Tuesday at Glendale Cemetery in Akron. The 1883 bell tower was restored over the spring and early summer this year by Stan Hywet Hall & Gardens subsidiary ARRC Inc. The frame roof built by Christian & Son Inc. was steadied into place by Powers Construction of Wadsworth.